The sleepy seaside town of Taviscombe has more than its share of gossips and schemers. It also has Mrs. Sheila Malory, a widow whose gift for judging character and unmasking murderers is as impressive as her knowledge of nineteenth-century literature. Mrs. Malory’s sleuthing talents are tested once again when she comes upon the body of one of her friends, a sweet elderly lady. Miss Graham’s death by poison is quite convenient for a local doctor of dubious reputation; the dead woman’s refusal to move thwarted Dr. Cowley’s plans to build a nursing home. But Mrs. Malory knows that nothing is as simple as it seems, especially when it is revealed that Miss Graham left a considerable fortune. Another suspicious death during a fireworks display further complicates matters. These two very different murders—one furtive, the other violent—can’t possibly be related. Or can they? 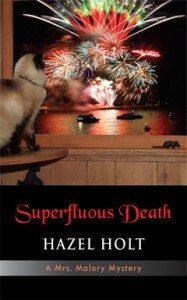 Bookstores and libraries can purchase Superfluous Death wholesale through Ingram and Baker & Taylor. The silence in the flat seemed a very positive thing, oppressive and unnerving, and I had to make a real effort to move forward and open the sitting room door. After the cold wind outside it was pleasantly warm and the flames of the gas fire flickered cosily. Miss Graham was sitting in her usual chair by the fire. Her eyes were shut and she seemed to be sleeping. I went over to her and said, ‘Miss Graham, it’s Sheila. Are you all right?’ But somehow I knew she wouldn’t reply; there was a feeling of emptiness, as if I was the only person in the room, talking to myself. I moved towards her and, remembering my Red Cross classes, felt for the pulse in her neck, but there was no movement. I took out my handbag mirror and, kneeling down beside her chair, held it to her lips, but the glass was not even faintly misted. As I touched her face, the skin felt slightly chill and clammy and I knew that she was dead. As I got stiffly to my feet my knees felt wet, but there was nothing to be seen on the carpet, which was fawn, patterned with large dark brown spirals. I bent down and touched the carpet beside the chair and it was wet, though with what I couldn’t tell. The shock suddenly got to me and I sat down quite abruptly on the sofa facing the fire. I was shaking and I suppose it must have taken me a good ten minutes before I got hold of myself and thought about what I had to do. I went into the hall and found Miss Graham’s address book by the telephone, looked up Dr Cowley’s number and rang the surgery. His receptionist, a nice middle-aged woman whom I knew slightly from the WI, answered. While I was by the telephone it occurred to me that I should ring Miss Graham’s nephew Ronnie. As her only close relative he ought to be told at once. I found the number of the shop and after a while a girl’s voice answered. ‘Can I speak to Mr Graham, please?’ I said. ‘Well, actually,’ the girl’s interest was aroused and she sounded more animated, ‘he’s got this flu thing that’s going about and he’s at home. You should be able to get him there.’ She gave me the number and then I suddenly thought of something. I thanked the girl and dialled Ronnie’s home number. The phone rang but there was no reply. Presumably he was in bed and it seemed rather unkind to make him get up when he was feeling rotten just to hear upsetting news. I decided to wait until later when Carol would be home, and put down the receiver. The silence closed round me again and I began to walk about the flat simply to create some kind of movement. Consciously I avoided the sitting room; I didn’t feel I could face the still figure by the fire. I opened the door of the bedroom and looked inside. Everything was immaculately tidy. Even in her eighties and hampered by ill health, Miss Graham kept up the standard of housekeeping that she had evidently learned from her rather formidable mother. The bed was covered with a fine patchwork quilt (I remembered Miss Graham working on it over the years). The dressing table, with its embroidered mats, was innocent of any cosmetics and held only a silver-backed brush and mirror, a photograph of old Mrs Graham, a bottle of Yardley’s lavender water and an old-fashioned ring-tree. There was a kettle and a tea-tray by the bed, a book (Rebecca by Daphne Du Maurier) and a bottle of tablets. I wandered out into the kitchen. Here too everything was spick and span. The work surfaces were clear except for matching storage containers and a wooden bread bin, so unlike my own clutter of jars, half-empty packets and old cat and dog dishes! The sink was spotless, the dishcloth wrung out and carefully spread over the taps and a washed cup, saucer and plate upended to dry on the draining board. A sudden humming noise made me jump, but it was just the motor of the refrigerator starting up. While I was still in this nervous state the front doorbell rang and I greeted Dr Barton rather incoherently. He stared at me curiously as I haltingly explained how I had let myself into the flat and had found Miss Graham dead. I’ve known Dr Barton for years. He was one of Peter’s clients, but neither of us liked him very much, since he is an austere, humourless man, with a precise manner. He’s as well known in the town for his finicky obsession with detail, with a meticulous adherence to the last letter of the law, as he is for his meanness and love of money. It was presumably the latter that had brought him in to cover for Dr Cowley, a man whom he personally disliked and whose methods he had been known to criticize. Glad though I was not to have had to face the oleaginous Dr Cowley in this distressing situation, I felt chilled and repelled by the sight of Dr Barton’s gaunt figure and severe manner. I followed him in reluctantly. He moved across and felt for the pulse as I had, and laid his hand on her forehead. ‘Difficult to tell how long she’s been dead, since the room is so warm.’ He looked at me accusingly, as if it was somehow my fault. ‘Yes. Right.’ Dr Barton began examining the body so I went out into the kitchen again and wandered aimlessly about, peering into the refrigerator (almost empty), opening and shutting drawers (splendidly tidy), turning a dripping tap off more tightly, and generally fidgeting about until Dr Barton called to me from the sitting room. He spoke with a certain grim satisfaction, as if he was delighted that Dr Cowley would be inconvenienced by the bureaucratic process. ‘Oh, well, thank you, that would be kind. I’ve got the dogs outside and they’ll be getting a bit restless, you know how it is …’ My voice trailed away in the face of his barely concealed contempt for people who kept animals and I picked up my handbag and shopping bag, in the bottom of which the now unneeded pot of jam rolled about forlornly, and prepared to leave. Thus dismissed, I made my way slowly out of the flat. The air struck cold but I welcomed the boisterousness of the wind as something positive and alive. I was shaken and upset, finding poor Miss Graham like that, and chilled by Dr Barton’s bleakness and lack of warmth and human sympathy. As I approached the car the two dogs started to bark and when I opened the door they greeted me with a frenzied excitement that suddenly brought tears to my eyes. I drove down to the sea front and we all three ran like mad things as fast as we could along the beach.